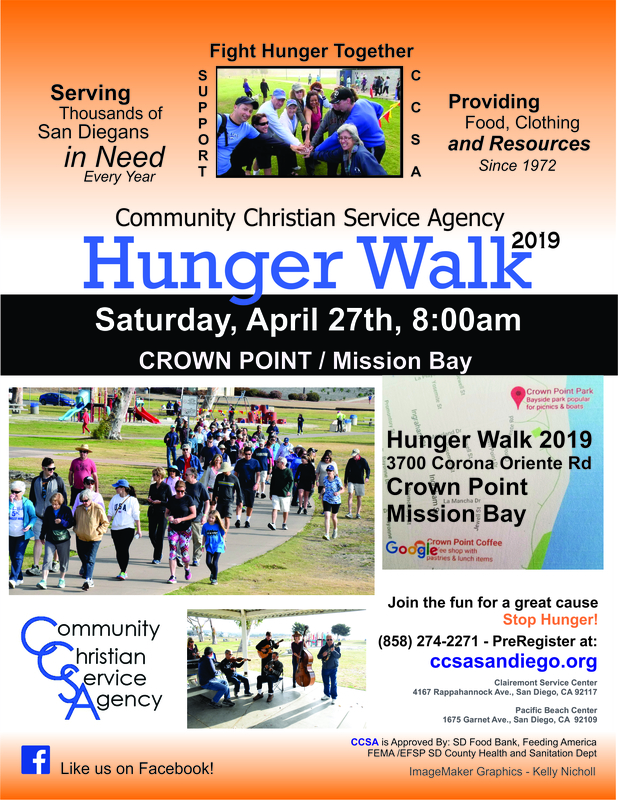 CLICK HERE TO REGISTER NOW FOR CCSA’S HUNGER WALK 2019! * CCSA has been offered a dollar for dollar match up to $25,000. * Your gift of $35 will help feed a family of four for a week, or provide meals to homeless. CCSA assists clients seeking immediate assistance with physical needs, guidance in obtaining more permanent assistance, and comfort in knowing their community cares. We do make a difference! Every life matters! If you would like to donate by check, please send your donation to our Clairemont office, and note Annual Appeal in the memo of your check. If you would like to make an online donation, please click our PayPal link on this page. 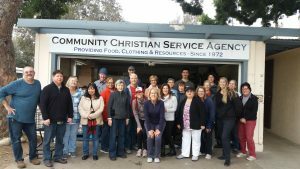 If you would like to set up a program of regular giving to support the ministry of CCSA, or to discuss other ways you can help, such as by volunteering at one of our Centers, please feel free to call our President Bradley Cannon personally at 619-405-0878. Thank you for all your support! 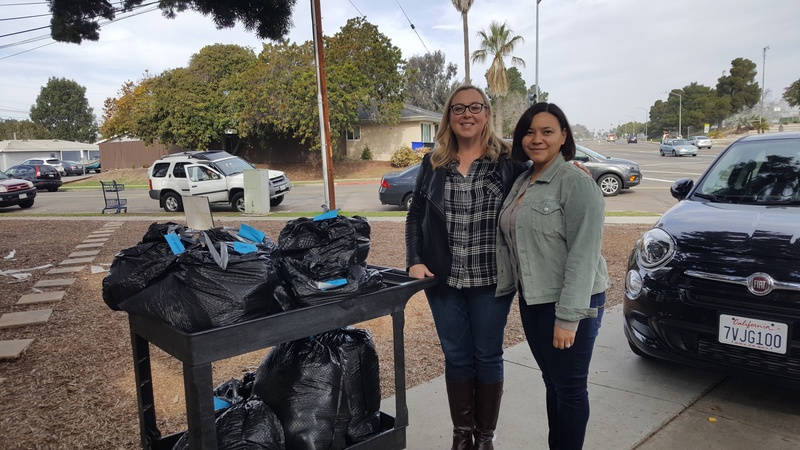 CCSA Board of Directors and Advisory Council wish to express sincere thanks to Caryn Blanton who began PB Street Guardians about 2 ½ years ago in the Pacific Beach area. This outreach program made it possible for our homeless brothers and sisters to be hired and paid for work in the community. It gave many the beginning hope to be able to change their lives. It brought not only that hope but actual results to 22 lives. Unfortunately, this outreach ministry had to close, but has had amazing lasting effects on those who chose to make their lives much better. In the time period serving others, 44 people came through this program. 22 of the 44 people have moved on to other employment opportunities and or housing. Seven PBSG Team Members came from the partnership with CCSA. 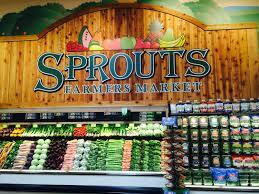 All of the Team Members have been resourced with benefits such as, CalFresh, MediCal, Substance Abuse Treatment, SDHC Rental Assistance program and other programs uniquely designed for their specific needs. Team Members have also been given the life skills training in the following areas so they are prepared for life off the streets. Conflict Resolution, Stress Management, First Aid, Budget Planning, Communication Strategies and Health and Wellness. CCSA wishes to thank Caryn for her dedication to changing lives. She was and is the true meaning of actively making a difference in the lives of those who are hungry, who hurt from the pain of living on the street and who just need the encouragement and support to make a change in their lives that brings them back to living a responsible and productive life. A life that restores their self-respect and with encouragement brings them hope that they have the skills to make their future better. Caryn, you are our hero! Thank you and God Bless you for all the work and energy you gave to this successful outreach program. WHEN VOLUNTEERS COME TOGETHER, MAGIC HAPPENS! 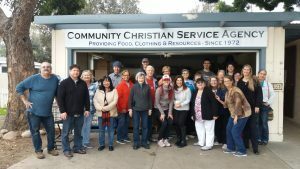 Twenty-eight volunteers from Clairemont Lutheran Church, friends and CCSA Board Members came together for a food sorting day. Working together, ALL the approximately 350-400 Sprouts donation bags were sorted and boxed along with the fresh fruits/vegetables in the garage. They had tables set up to cover the entire patio including the back patio and worked a long day getting everything ship-shape. When all was sorted and stored, they cleaned up the storage areas and even the kitchen! It was great to see so many hard working people; we are truly lucky to have this kind of support! Thank you Clairemont Lutheran Church and all the volunteers! Click here to receive future CCSA newsletters by email! Enter your email address. If you are currently receiving the newsletter by mail and no longer wish to receive it, please also include your address so we can update our mailing list.